Organise a Trade Fair - Veronafiere S.p.A.
Veronafiere perfectly integrates the modern exhibition possibilities with the best meeting opportunities. Thanks to a strategic geographic position, in the centre of the major European travel routes, and handy for the main facilities of the city of Verona, Veronafiere is the ideal place to organise an event. 300,000 square metres of exhibition space, 13 pavilions, made to measure services and spaces to rent, set up and customise. The pavilions are wired and fitted with an HVAC system, there are outdoor exhibition spaces, indoor and outdoor carparks, catering structures, a press centre and interpreting service, business meeting point, reservations and check-in service at the exhibition centre. 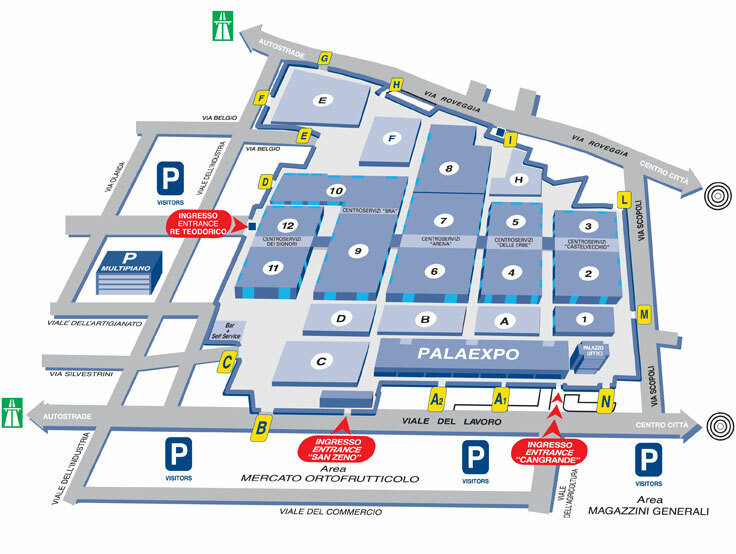 Veronafiere has 12 carparks, some of which activated only for determined events: P7 Re Teodorico Viale dell’industria, P3 ex Mercato di Viale del Lavoro, Palaexpo, Via Scopoli, Palazzo Uffici, Torre Telecom, P2 Ex Mercato with entrance from Viale dell’Agricoltura, Stadium carparks, P4 Multi-storey Viale dell’Industria, P9 angolo Via Roveggia / Via Scopoli, Scalo FF.SS and Veronamercato. There are three entrances (Cangrande, San Zeno and Re Teodorico) managed with computerised control to optimise the entrance flow.